Following up on the Sgt. Telion conversion I did this weekend, I managed to get the Pedro Cantor conversion done and painted as well. Just like the first model and all the rest to come I'm sure, there were some icons that were cleaned off and new ones added. This guy seemed to have a Crimson Fist symbol just about everywhere. 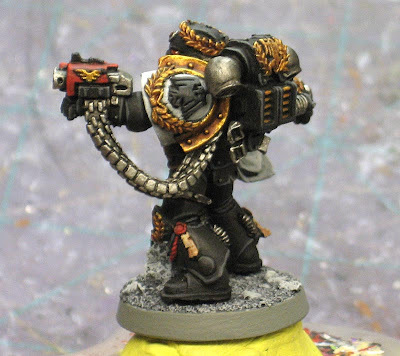 Both arms, belt buckle, backpack, you name it, there was an Crimson Fist icon. I did not attmept his banner though, Since it's so flat, there is almost no way for me to get in there and remove just the part I need to without destroying the whole thing. 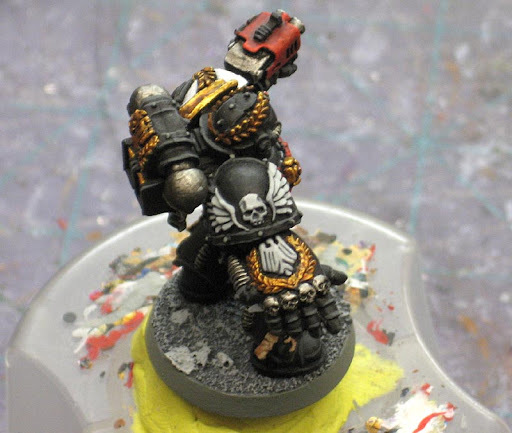 To help break up all the black armour, I decided to reverse his left shoulderpad to help set him apart from the rank and file. As if you couldn't tell he was important with all the gold he's wearing. The white on this shoulder helps balance out with the white on his other shoulder. And the other side. Overall I kept the model fairly close to the original. Both in where I put the icons and how I painted it. I figured if it worked before, why change it. I kept the gun red as a consistency thing and mounted him on a resin base just like the previous model. I also used his backpack even though I didn't use the banner because it has the ammo case mounted to it. 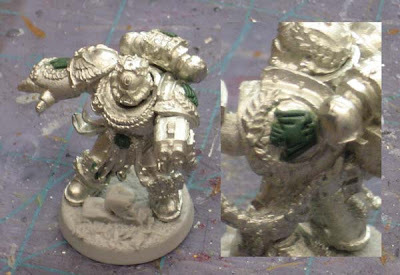 Next up will be the Master of the Forge conversion. That is simply brilliant. Bravo! Wow. The re-chaptering work is fantastic. Looking really good, Ron. I love the highlighting you are doing on the black armor. I think it looks so much better when done lightly. Awesome! Cool, love your painting style. 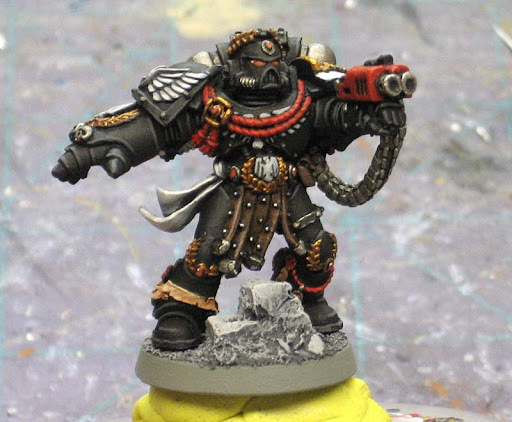 How do you do the greyisch black armor and the nice gold parts? Anon: The armour is just black. In certain areas (like the tops of the shoulderpads), I'll go in with the same dark grey I'm line highlighting with and blend it from the top down in a real smooth gradation. It gives the armour a nice look. I did it on his right shoulderpad, but it can be so subtle you don't even notice it. The gold is GW shining gold over a brown basecoat and then washed with sepia, devlan mud and then sepia again. Great job Ron! The paint scheme works really well on this model and alternating the shoulder colour is a great idea. Not to be a stickler but Pedro is a Crimson Fist not Ultramarine. Excellent conversion Ron and cracking paintjob. I'm guessing the Raven Guard symbols are being done with a push-mould? Great stuff Ron. Any chance of a better look at that symbol you put on the backpack? Vredesbyrd: I don't even know what that it is so there's a good chance that's not what I'm doing. Each icon is custom sculpted in place to fit the space provided. The_King_Elessar: Fat chance. That one came out the worst. I had the hardest time cutting out the previous icon and could barely sculpt the new one to line up correctly. It passes for acceptable only due to it's size. Ohhhh is good job, i love small changes !!!!! what tools / How do you remove the original icons without damaging the detail around it? Heinz: For the most part, I use an X-Acto blade to get the offending icons off. Sometimes I use a small file to smooth areas out, but it's generally just trimming away at it carefully with the X-Acto. Will have to try that with my Kantor & other metal figures.